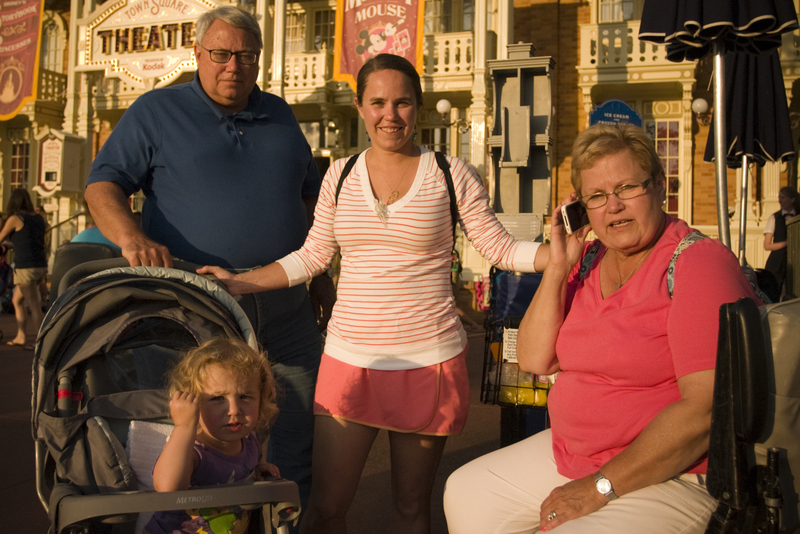 In June 2012, We went on a big extended family vacation to Disney. My sister wanted to take her kids to Disney for the first time. After much discussion on how young is too young to take kids to Disney we finally convinced everyone in the party that Grady age 3 and Audra (just turning) age 2 were “old enough”. We started planning in Feb 2012 which as it turns out is late to be booking Disney. There were 6 adults and two kids going on this vacation. After lots of research we decided get a Villa and to buy points from Disney vacation club members. You can do this two ways by going through the DisBoards or by going through a service called David's Vacation Club Rental. We choose David's VCR for the easy of service and many good reviews it had online. The points cost $13 each from David’s but can be less if you rent directly from Vacation Club Members on the DisBoards but there is some risk by not using a service. Check it out for yourself before going down this road. Depending upon the resort selected and the time of year the number of points required changes. They have a very helpful points calculator to help you determine the cost. Click here to check it out. They require a deposit (partial payment) of $91 to start the process. This will get applied to the booking once complete. If they are unable to book your selected resorts in the time you want the money will be returned. We filled out the form online they told us that our top three resorts were already booked for the time we selected to go for the two bedroom villas. Our selections were Wilderness Lodge, Beach Club and Boardwalk. They informed us that the Animal Kingdom Lodge was available for the two bedroom villa. Our family was not excited about this property but after we researched the resort it seemed to be our best option. I emailed back the next day and it was now unavailable! Lesson learned book quickly. Now we really needed to get creative. I asked them to check smaller amount of time (3 days rather than 5 days) The thought that we could switch resorts. They came back with the Wilderness Lodge was available (Mon-Thurs) This is great because it was one of our preferred resorts at Walt Disney World. Now we just needed to find another room for the first two nights. Moving a family of 8 to a different resort could be a challenge so we started by looking for two regular rooms at the Wilderness Lodge. They were available (Sat-Mon) but at a much higher price combined than the villa. We ended up taking this option. While we would have like to book the two bedroom villa for the entire vacation at one of our preferred resorts we were booking late and this was the option that got us in the property we wanted for least amount of money and convenience to Walt Disney World. I would highly recommend using David's Vacation Club to rent villas. Service was great in despite of lack of room availability. They only downside of using this service is that you are required to pay up front for the entire stay. If you can get past this fact you can get a really good deal on some premium properties at Walt Disney World! Cost break down was 48 points per night at the Wilderness Lodge for a two bedroom villa during the "Magic" time period. So 48 x $13 was $624 per night so a total of $1872. There were no additional cost thru David's Vacation Club Rentals. And if you were wondering the two nights in the two standard rooms going directly through Disney Booking was more expensive per night than the villa. But the villa had so many extras…Full Kitchen, Washing Machine and Dryer, Private Swimming pool and most of all more room for privacy! The Wilderness Lodge was a great location for our family. The patriarch of our family started the vacation by saying "We should have just stayed at the cheapest value resorts" and in the end his comments were "Staying at the Wilderness Vacation club villa was great, next time we will stay in the villas again" Sounds like we converted him to vacation club villas?! Priority Club Point Break List is out Today!